Find the right tour for you through Ramallah. 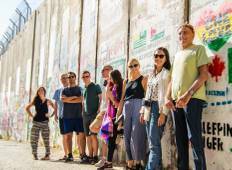 We've got 5 tours going to Ramallah, starting from just 3 days in length, and the longest tour is 12 days. The most popular month to go is June, which has the most number of tour departures. "The trip added very well to my studies at Tel Aviv university"
"Hebron dual narrative tour was amazing"
"the tours were incredible. my only observation was that it was not clear what the..."